Just because corporate executives pay hundreds of visits to the White House doesn't prove that their firms are benefiting from White House connections. Perhaps it's just a useful way for the White House to gather information and input about economic effects of real-world policies. Perhaps it's a useful way for the White House to get a little reflected glory from those who run successful companies. Perhaps it's a way of rewarding diehard supporters who would have been supporting you anyway. 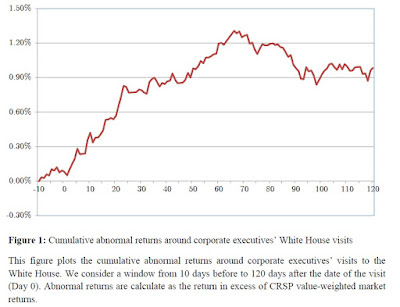 But Jeffrey R. Brown and Jiekun Huang actually take a look at how corporate stocks perform right around the time of White House visits. Their evidence appears in All the President’s Friends: Political Access and Firm Value," which appears as a National Bureau of Economic Working Paper (#23356, April 2017, not freely available on-line, but many academics will have access through library subscriptions. The Brown/Huang approach is fairly straightforward. 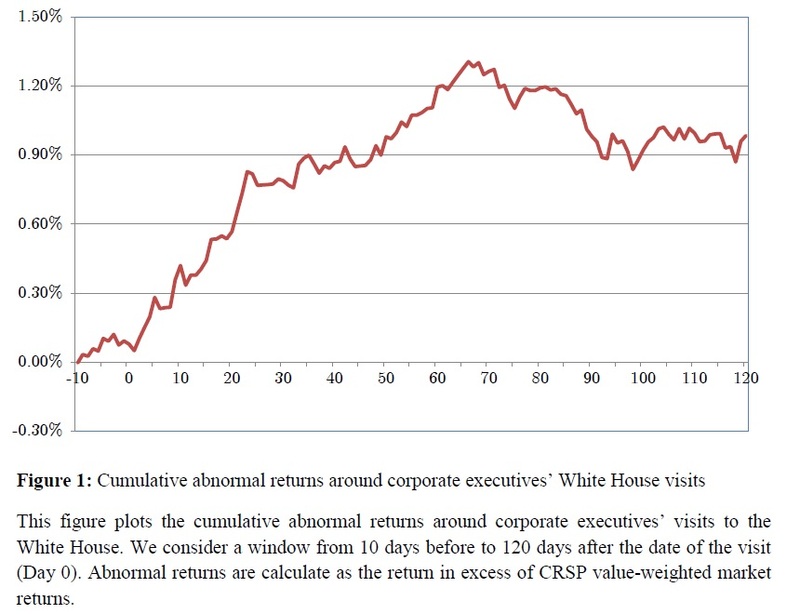 They look at the stock market returns of companies in the 10 days before and the 120 days after the visit of a top executive to the White House between 2009 and 2015. According to the White House logs, there were 2,286 visits by top executives to officials at the White House during these seven years, which includes more than 100 visits apiece with Barack Obama, Valerie Jarrett, and Jeffrey Zients. Brown and Huang adjust for how the overall stock market is doing, so they are looking at "abnormal" returns that differ from the average for the market as a whole. Here's a figure showing the pattern they find. Within about 30 days of the visit of a top executive to the White House, on average a company sees its stock rise by nearly 1% more than the market as a whole--and then remain near that higher level at least through the 120-day horizon. 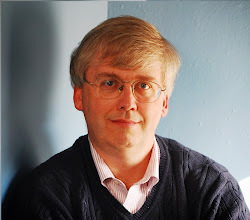 When the authors break down the statistics by year, they find that the "cumulative abnormal returns," as they refer to these calculations, "are significantly positive during the election year (2012), the first years post-election (2009 and 2013) as well as 2014, suggesting that access to influential government officials is particularly beneficial during those years." Of course, the pattern shown here doesn't prove that companies are benefiting from their White House connections. Perhaps stock market investors mistakenly perceive a White House visit means good news for the company. Perhaps top executives are more likely to get a White House invitation when good news is about to arrive for their company. But it's an interesting tidbit of actual evidence.